More wartime destruction, this time of the late-Georgian Devon and Exeter Subscription Rooms left also known as the Royal Subscription Rooms or the Royal Public Rooms. 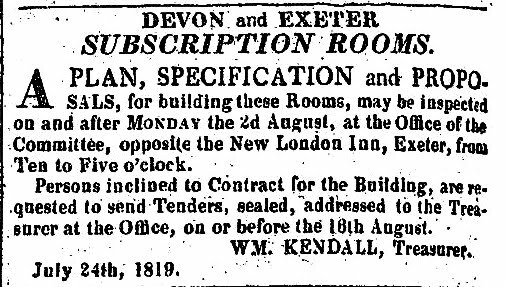 As always in Exeter, the site upon which the Subscription Rooms were built had a long history stretching back many centuries. Prior to the Rooms' construction the land had been partially occupied by the old Bristol inn and three tenements. Adjacent to this group of buildings, closer to where Northernhay Place is today, were Hurst's Almshouses described by Jenkins in 1806 as "six small houses, with a small garden behind, built for twelve poor tradesmen of this city, or their widows, built by William Hurst, Esq." William Hurst was a five-times mayor of the city who had endowed the almshouses on 13 October 1567. Situated outside of the East Gate, the gardens of the almshouses would've backed onto the exterior of the city wall. A report on the demolition of the almshouses and the Bristol inn, and the subsequent building of the Subscription Rooms appears in a report made to the House of Commons in 1834. Since the East Gate had been demolished in 1784 it had, states the report, "been in the contemplation of the [Exeter] chamber to improve the buildings on the outside of the gate, which were old and in a very dilapidated state." 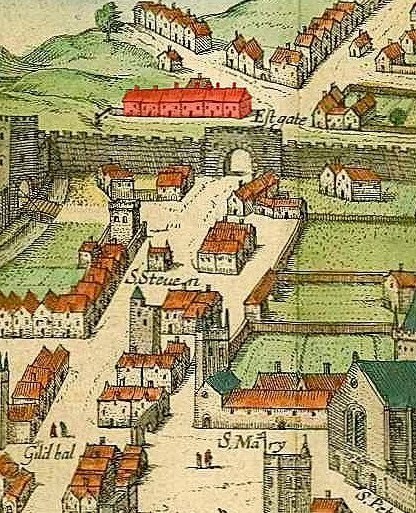 The 1587 Braun and Hogenberg map of Exeter right shows what are almost certainly the six almshouses mentioned by Jenkins, highlighted in red. Given that the almshouses were directly in the firing line during the English Civil War it seems likely that they would've been either deliberately slighted by the defenders to prevent them being used by the city's besiegers or they would've suffered damage from cannon fire and musket shot. It therefore seems probable that the physical bulk of the almshouses dated to the second half of the 17th century even if their foundation was much older. The city's plans to rebuild the site of the Bristol inn, the three tenements and the six small almshouses soon ran into problems. The city chamber got its hands on the Bristol inn in 1795 but the three tenements appear to have been part of the original deed of 1567, their rents being used to help with the maintenance of the almshouses and occupied on a lease-for-life basis. The chamber could do nothing until the tenants in the three tenements died. The last tenant died in 1818, and from 1795 until then the Bristol inn had been leased out on a yearly contract. According to the parliamentary report, in 1818 the three tenements were found "to be in a very ruinous and scarcely habitable state". It was agreed between the chamber and the lessors that the three tenements would be demolished and new houses constructed in their place. The image left shows a detail from the 1905 map of Exeter overlaid onto a modern aerial view of the same area. The oval bulk of the recent Next building is to the bottom. The Debenhams tower block is the top right. A wide range of interesting pre-war buildings can be seen around Eastgate. The New London inn is highlighted in purple. 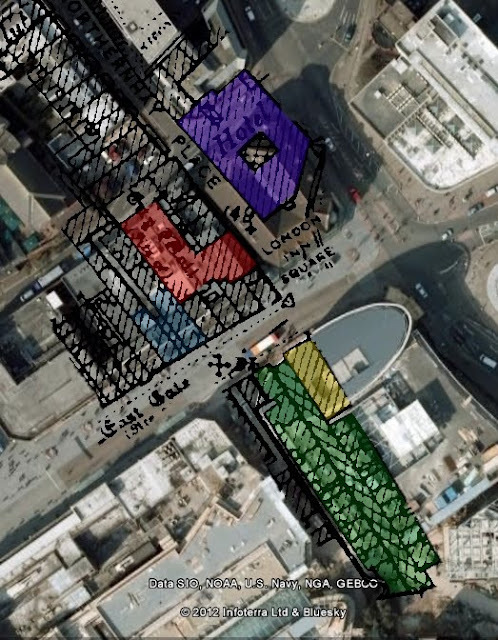 The Eastgate Arcade and Coffee Tavern are highlighted in green and yellow respectively. Nos. 266 and 267 High Street, built in the 1770s from the recycled stones of the East Gate are highlighted in blue. The Subscription Rooms are highlighted in red. The area was totally rebuilt after it was bombed in 1942. It can be seen that the entrance into the Subscription Rooms was via London Inn Square and not the High Street. The original intention seems to have been to keep the Bristol inn but, according to the same report, after the three tenements had been rebuilt the Bristol Inn "formed such a contrast to them, that it could not with propriety be continued in its then state". It was considered too expensive to modernise the Bristol inn but it is also apparent that from an architectural perspective the old inn, probably gabled with oriel windows and constructed from timber-framing under a stucco exterior, didn't fit into the modernising vision of the city chamber. In May 1819 the site of the Bristol Inn was offered up as a leasehold "for the purpose of erecting public rooms thereon". The report goes on to state that it "appears to have been an essential part of this proposal, that the almshouses should be removed, and their site included in such a lease". A letter in Trewman's 'Exeter Flying Post' on 08 April 1874 gives a brief description of the Bristol inn and almshouses prior to their demolition. 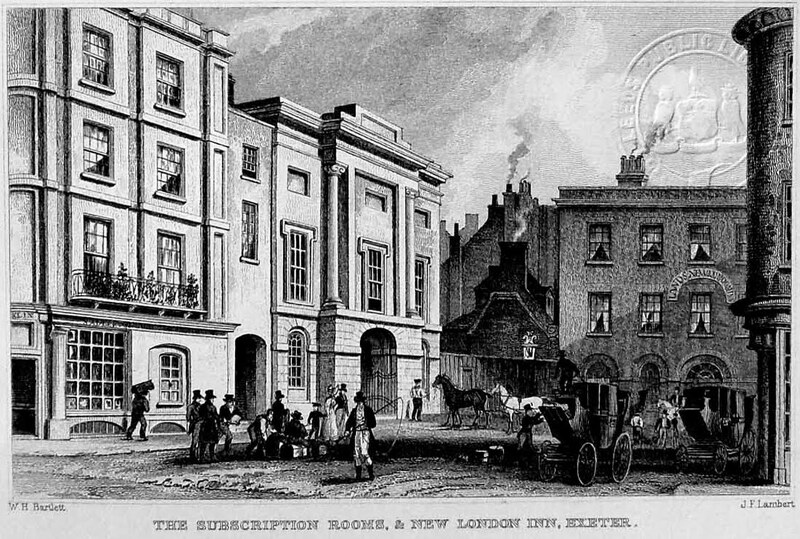 Written by 'A Former Resident', the letter states that the Bristol inn had "two entrances; one in the London Inn Square, wide enough for coaches to enter, the other in the High Street...Behind this inn was a very large yard and garden, running the whole [length] of the Subscription Rooms. In front of this stood some almshouses, and being very much decayed, were destroyed". It seems that some members of the city chamber questioned at the time whether the land on which the almshouses stood didn't actually belong to the city, implying that William Hurst didn't have the legal right to endow the almshouses in perpetuity (and therefore giving the chamber total claim to the land!). It's possible that the almshouses were constructed over the ditch which ran along the base of the city wall, technically the property of the city chamber. The parliamentary report dismissed the suggestion but did state that one of the new houses built near to the Bristol Inn already belonged to the chamber, "the site of it being the spot where the [north] tower of the East Gate stood". Anyway, despite all of that the scene was set for the creation of the Subscription Rooms. Prior to their construction the only place for public events, concerts, exhibitions and dances within the city was in the assembly room at the Hotel i.e. 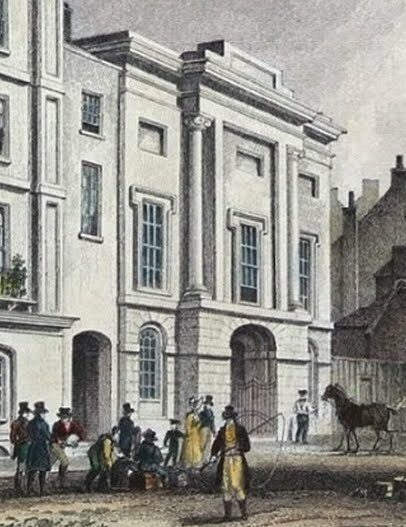 the Royal Clarence Hotel in Cathedral Yard, which had opened in 1769. 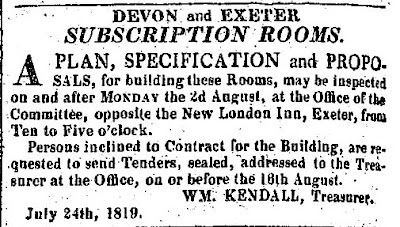 An advert in the 'Exeter Flying Post' on 29 July 1819 left announced that a "plan, specification and proposals for building these rooms" could be seen at the New London inn from the 02 August 1819. The architect of the Devon and Exeter Subscription Rooms was William Burgess, a local man who had recently remodelled the medieval church of St Sidwell's just outside of the city walls (damaged in 1942 and later demolished). 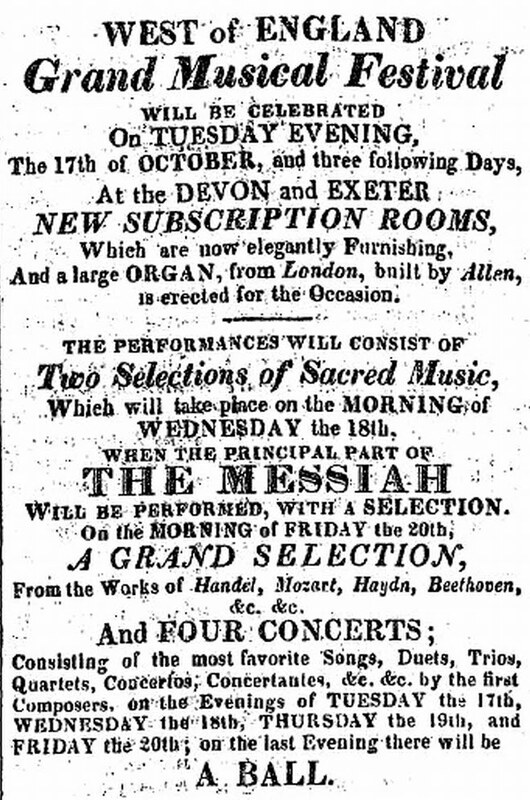 The Subscription Rooms were financed by subscription from members of the local gentry. The two chief architectural features of the Subscription Rooms were its huge neo-Classical facade and the ball room inside. The three-bay facade had a width of 44ft. The ground floor featured a large central arched entrance way with two tall, arched windows on either side. The central bay of the facade projected out slightly into London Inn Square and on either side of the central bay were gigantic columns with Ionic capitals. The second floor had rectangular windows surrounded by simple decorative mouldings with a third floor merely suggested by the use of three blind windows. The entablature had a cornice which ran across the entire facade. The whole was probably constructed from brick with stucco applied to the outer face, with 'joints' incised into the lower floor to resemble blocks of stone. As can be seen on the map above, the Subscription Rooms were an 'L' shaped building with the ball room at a right angle to the main entrance. 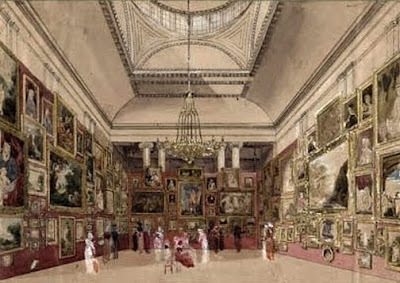 Internally, the building comprised several small exhibition rooms and the ball room itself. The ball room was 91ft long by 41ft wide with a height of over 40ft. At least one end of the ball room had two pairs of Ionic columns which matched the ones on the exterior while around the walls were pairs of Ionic pilasters. The room was illuminated by an arch-dome ceiling from the centre of which hung a large chandelier. As the 'Devon and Cornwall Illustrated' said in 1832, it was "on a scale of magnitude and elegance commensurate with the city to which it belongs". As far as I know, the illustration above right © Devon County Council is the only depiction of the interior of the Subscription Rooms which exists. It shows the ball room being used as a space for an art exhibition c1860. 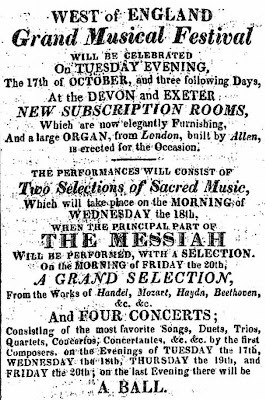 The Subscription Rooms opened on 17 October 1820 with a "Grand Musical Festival" left which consisted of six separate performances spread over four whole days. The concert was organised by James Paddon, the organist at Exeter Cathedral who conducted the orchestra, soloists and choir from the piano. There were extended extracts from 'The Messiah', and music by Mozart, Haydn and Beethoven (who was still alive in Vienna at the time). From its opening until 1908 the Subscription Rooms were the centre of the city's social, cultural and political life. For almost a century the regional newspaper is full of references to musical concerts, plays, talks, meetings, auctions, speeches, balls and exhibitions of everything from paintings and sculpture to archaeological remains. For example, the rooms were used as part of the city's celebrations to mark the coronation of George IV in 1821. According to the 'Exeter Flying Post', the decorated ball room presented a "most magnificent appearance". The Subscription Rooms survived in their late-Georgian form until November 1908 when it was converted into a cinema called the Hippodrome. The Hippodrome survived until February 1931 when it reopened as The Plaza, another cinema. Throughout these changes the neo-Classical facade survived intact, and it's likely that much of the Regency interior survived too, hidden beneath the conversion. Surviving photographs from the 1930s show a sadly neglected and run down exterior although it is to be hoped that had the building survived it might've been restored to its former glory. All the other properties which had replaced the Bristol inn, the almshouses and the three tenements in the 1820s had also survived relatively unchanged. The entire building was engulfed by a giant fireball during the Baedeker Raid of 04 May 1942. By the following morning there was nothing to see except rubble. 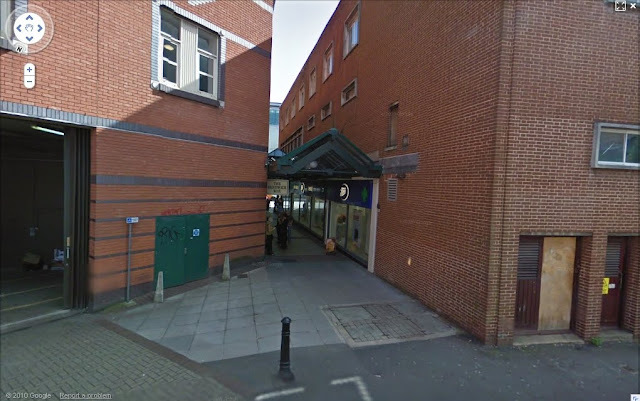 The area was rebuilt after the war and the site of the Subscription Rooms is now Boots the Chemist. London Inn Square has also ceased to exist following the construction of what is now Waterstones bookshop. The small covered passageway between Boots and Waterstones below, leading through from the High Street to Bailey Street and Northernhay Place, runs past the long-vanished facade of the Subscription Rooms, which would've been on the right. Today there is no sign that the building was ever there.